I don't see were it shows what the actual damage is from applying bees on AMC. The passive just says applies damage every .5 for 2 sec. 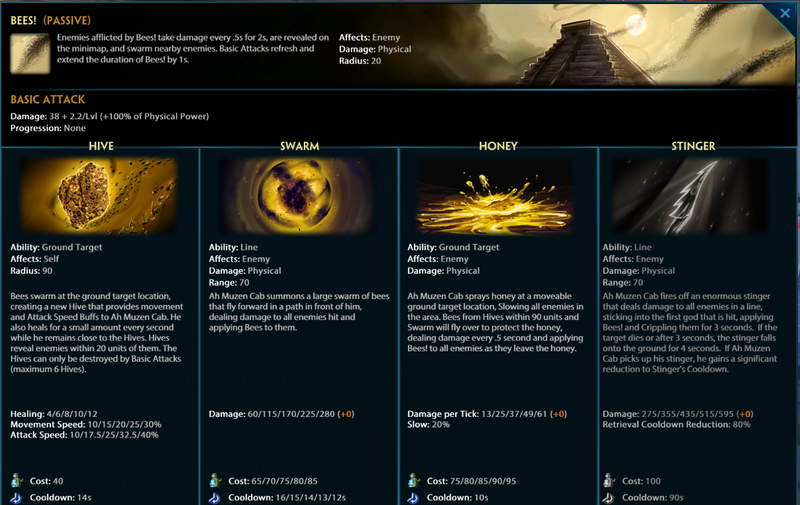 The abilities just list 'applies bees'. Honey does damage over time and then also applies bees. Does this mean the passive 'Bees' is based of the DOT damage from honey? The passive used to list the damage I thought. Would be nice to have it clarified by the devs. Bees do 9 (+6% of your power) damage per tick. It shows in game with the K-screen in the top left. Nowhere in game does it actually state the damage. Neither on the K screen, in the god loadout nor the god abilities pages. That's a damn good question. How much damage does it do? Thanks for pointing that out. So that makes me wonder is the passive a percentage of damage per DOT? I'm really wanting to know now. Ahhh okay yeah they should post that in game.